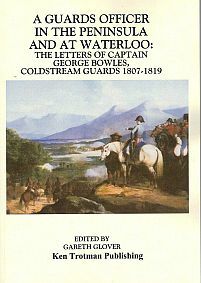 The very short memorandum of his Waterloo experiences by Captain George Bowles of the Coldstream Guards is very well known and often quoted in histories of the battle. His letters were published in A Series of Letters of the First Earl of Malmesbury, his Family and Friends from 1745 to 1820, published in 1870. This book is rare and I have spent ten years trying to obtain a copy. Having recently realised my ambition, I discovered that the book actually contained a very long series of letters from this officer detailing his service at Copenhagen, the Peninsula and Waterloo. These letters are of great interest, particularly as they give honest assessments of the current siruation and does not spare criticism of senior officers, including Wellington. George Bowles, the second son of William Bowles of Heale House, Wiltshire, joined the 1st Battalion the Coldstream Guards as an ensign on 20 December 1804, his rise through the ranks was far from rapid, becoming a lieutenant & captain on 1 February 1810. It was in this rank that he served through most of the Peninsula war except for one period of extended sick leave spent in England. 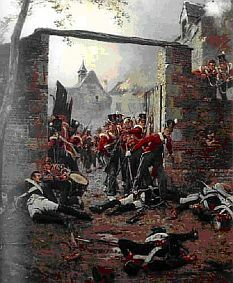 Returning home at the end of the war in 1814, he temporarily transferred to the 2nd Battalion in October 1814 which had remained in garrison in Belgium. It is lucky for us that he did, for being so highly connected with the Duke of Richmond (he was to have been his ADC if he had gained a command), Lord Wellington and many of the senior officers in Belgium, he was able to furnish some very useful first hand accounts of the operations on those three fateful days in June 1815. George Bowles was given a brevet majority for Waterloo and eventually became a brevet lieutenant colonel on 14 June 1821. He was Military Secretary to the Duke of Richmond when he was Governor General of Upper Canada and was with him when he died of rabies following a bite from a tame fox on 28 august 1819. He later became General Sir George Bowles, KCB, Colonel in Chief of the 1st West India Regiment, Lieutenant of the Tower of London and Master of the Household of the Queen from 1845-51. He died in London on 21 May 1876.